Over at Sahel Blog, Alex Thurston has a typically excellent piece rebutting Sebastian Elischer’s arguments about Islam in Mali, particularly Elischer’s characterizations of Salafism in the country. Alex makes a number of important points in the piece, especially with regards to the fluidity of Salafi belief and practice (as opposed to the “tri-partite” division of Salafis into “quietist”, “politicos” and “jihadis”), the danger of outsiders picking “good Muslims” and “bad Muslims”, and the difficulties in labeling Salafi or Wahhabi actors like High Islamic Council President Mahmoud Dicko as “anti-democratic”. These are all necessary distinctions that have become increasingly important as African and international governments discuss not just extremist violence but also counter-radicalization programs. These discussions often revolve not just around questions of correct belief and practice, but also on the governance of Islam, and by extension the governance of Muslim believers. One corollary of this governing imperative is not just the distinction between “good” and “bad”, but the idea that the “good” is local, African, and traditional, and that the “bad” is foreign, most commonly associated with the Arab world and particularly the Gulf countries. While scholars of Islam in Africa have long disputed or critiqued these notions, they remain surprisingly prevalent in popular conceptions of Islam in Africa. In November, the Senegalese President Macky Sall spoke to the opening of the Dakar International Forum on Peace and Security in Africa, where he stated that “we cannot accept models that correspond neither to our conception nor our traditions of Islam…[models] imposed in Africa simply because Africans are poor and there is a need to finance mosques and schools.” This corresponds with a popular narrative that Salafism and Wahhabism — the two terms are often incorrectly glossed — came to West Africa from the outside as an imposition that disrupted previous African Islamic beliefs, and that the subsequent spread of these ideas can be traced to Gulf money and the work of missionary groups like the Jama’at al-Tabligh. There is certainly some truth to these ideas, but they also fail to capture the nuanced and complex history of Islam in Africa, and they also engage in some very problematic ideas of Islam on the continent writ-large. Historically, the drivers of Islamic reform in Africa were Africans, whether that reform came under the auspices of Sufi jihads in the 17th, 18th, and 19th centuries, or people more closely identified with Salafism in the 20th century. These Muslims were often in contact with other parts of the Muslim world from Algeria to Egypt to Saudi Arabia to India, but that should not be surprising. Africa has never been detached from the world as colonial officials thought, and there is no reason why African Muslims would not be aware and part of the intellectual and political movements impacting other parts of the Muslim umma. Chanfi Ahmed’s new book, for instance, demonstrates the role that West African ‘Ulama played in shaping and promoting Wahhabism in Saudi Arabia as well as among African and other non-Saudi populations. Religious conversion or the adoption of new or different ideas and practices happened with the influence of outsiders, yes, but also through the intervention and choices of Africans. There is no immutable tradition or isolated African Islam that was simply swept aside by Salafism, but a process of negotiation and change that involves much more than just Saudi money flowing into Africa. West Africa broadly and Mali more specifically provide a very good case study for understanding some of this complexity. The reformist movements over the past several hundred years in the region have more often been led by religious leaders associated with a Sufi brotherhood like the Qadiriyya or the Tijaniyya. The first major modern reformist movement in West Africa, the Ittihad al-Thaqafi al-Islami or Muslim Cultural Union (UCM in French), can be considered Salafi in orientation* but grew almost exclusively out of the work done by members of prominent Sufi families who had previously rejected some of the major religious practices associated with Sufism in West Africa in the early part of the 20th century. Additionally, the UCM’s efforts to modernize education and spread Arabic paralleled those of “reformist” Sufi ‘Ulama like the Senegalese Tijani Sheikh Ibrahima Niasse and the Malian Tijani figure al-Hajj Sa’ad Oumar Touré. Touré is widely regarded as the most influential figure in shaping contemporary Arabic education in Mali, and his madrasa in Segou educated a number of prominent Malian religious figures, including the more “traditional” religious leader Cherif Ousmane Madani Haidara. So in Mali, religious and educational reform that helped create what Robert Launay and Benjamin Soares called the “Islamic sphere” in West Africa was the work of Salafis but also Sufis, and all of them closely in-tune with local political struggles as well as international changes in Islam. And even today, for all of the talk about Salafis as challenging the ostensibly secular state in places like Mali, Sufi and “post-Sufi” leaders do just as much to bring Islam into the public sphere and influence the state in various ways. Both Salafis like Dicko and “moderates” like Haidara mobilize followers and ideas in ways that influence the state and shape its politics and character. That can have important implications for counter radicalization, but also for the issues that have much more of an impact on the lives of everyday people on issues ranging from government services to Family Codes. In trying to promote one over the other, governments can still end up reinforcing the role of religion in politics and public life, whether in West Africa, North Africa, or the Middle East. I am neither African nor Muslim, and it is not for me to say whether or not this is a good thing. But a narrow focus on counterterrorism and counter radicalization — however defined and implemented — often misses the broader impact of security-focused policies for the societies in question. *The UCM’s exact ideological orientation is a bit difficult to characterize, but most scholars characterize them as reformist, and they pushed for moral and educational improvement, the teaching of Arabic, and attacked some common Sufi practices that they characterized as bid’a. They also referred frequently to thinkers like Muhammad ‘Abduh and Rachid Rida, and spoke of the need to return to the example of the Prophet Muhammad and his companions. I’ll admit it, sometimes I’m a sucker for the kind of pop culture hot takes that are sucking up an increasing amount of social media oxygen. These have taken a particularly intense turn with the impending release of the new Star Wars movie, which has sent writers and editors scurrying into the click mines. As political scientists Patrick Thaddeus Jackson and Daniel Nexon noted in their excellent piece on the relationship between pop culture and political science, “It’s as if a thousand editors cried out for clickbait, and no one had the courage to silence them.” Hear hear. For the authors, this failure to account for context and the fictional texts themselves means we lose the ability to read or watch them for their actual messages about politics and society. At the same time, directionless analysis that looks for lessons about politics from Emperor Palpatine (but seriously, who thinks this is a good idea?) also makes for bad interpretations of our own world. The fictional can approximate the real world, but it remains only an approximation, one that works according to the story that scribes and filmmakers want to tell. Search elsewhere for answers, you must. But for all of the problematic constructs that Jackson and Nexon correctly document and dismantle, they are missing one important word: Anachronism. In very brief, anachronism is the act of applying one environment, context, or set of ideas to another time and place — or a galaxy far, far away — where these concepts do not necessarily apply or have the same meaning. I have no doubt at all that the authors know and take the concept to heart. After all, what they described and critiqued in their article is anachronism in every sense. So why does the word matter? For me, the importance of the word lies in what its absence illustrates about some fundamental differences between political science and historical analysis. I do not want to put too fine a disciplinary point on this issue, since people are not their academic disciplines, and vice-versa. Many, many political scientists appreciate and stress the value of context, deep experiences of places and people acquired through study and fieldwork, and the avoidance of choosing frameworks that overgeneralize in the quest to make larger points about political order. However, the field itself does not place the same emphasis on avoiding anachronism as History does, and that matters. Historians are not always saints in the avoidance of anachronism, but it is widely considered a “sin” in the field, one of the worst you can commit. Historians at every level of study from high school to graduate training are inculcated in the horrors of anachronism. When I begin a class I explain the concept to my students and talk about it at length with them so that they can keep it in mind throughout the term. Sometimes this emphasis can go too far, where historians overcontextualize or avoid frameworks for fear of omitting important details, as the historian and sociologist William Sewell wrote in The Logics of History. But the focus on avoiding anachronism is also a key analytical strength of History. It forces students and practitioners alike to ask difficult questions about their sources, weigh incomplete and uneven information in light of what we know, what we think we know, and what we do not know, and also take note of the ways in which our experiences and perspectives can both inform and occlude our perspectives on the past and present. This fine-grained attention is crucial both for historical and contemporary analysis, where one can only understand how things change over time with a careful understanding of different contexts at all levels of a study. And maybe, just maybe, it will cool the ardor of hot take warriors before they opine blithely on destroying far-away worlds in the name of page views. This post will be part personal update, part promotional entry, and part reflection on the past few years and resurrecting a dormant blog. When I started al-Wasat with my good friend Aaron Zelin, we intended it to be a chance to explore at length some of the niche issues that interested us. In that time, many of these issues have become less niche, while we’ve also both moved on to some different but related things. When I went back to school in the fall of 2013 to pursue a PhD in African History, I consciously took a step back from the kind of policy-related writing I’d done in the past. I’ve stayed active (too active) on Twitter, but while I’ve continued to occasionally write articles and short essays, much of my attention has been focused on my academic work. Now I’ve finished coursework, passed my language qualifications, and begun the process of applying for research fellowships and reading for my comprehensive exams in the spring. While this is a busy time, it’s also a good one for me to reflect a bit on the relationship between academic work and more contemporary research. In my time in academia I’ve found that while many people are more open to engagement with the world outside, even though the stereotype of the Ivory Tower academic is only partly true at best. Many people instead already do engage extensively with non-academic subjects and themes, and others want to do the same but are not quite sure how. For historians in particular, it can be challenging to relate research into the past to contemporary life. It can also be difficult to find time for this work when academic programs and job markets do not generally reward things like blog posts, articles, and media appearances. This is changing rapidly, and there are already fantastic examples of scholars doing deeply researched, rigorous work about the past and present that remain connected to the contemporary world in interesting and new ways, whether at Jadaliyya, Alex Thurston’s Sahel Blog, Malika Rahal’s Textures du Temps, or elsewhere. These blogs and the people who run them have helped inspire my own commentary and writing for years, and will continue to do so. Along those lines, I’m going to take more time in the coming months and years to write publicly again about the issues and parts of the world that interest me the most, namely North and West Africa. My goal is to stay engaged in current debates while also using my historical research and training in different ways. In doing so, I want to explore not just the connections between the past and the present but also how historical methods can inform analysis. Those kinds of reflections and the personal connections to events far away were part of a piece I co-wrote with Prof. Gregory Mann for the Washington Post’s Monkey Cage blog on the recent attacks in Paris and Bamako. In that piece and another for Al Jazeera America, I emphasized the Malian context for the Bamako attacks and Mali’s eroding security environment. And in a wide-ranging conversation with Karl Morand for his excellent Middle East Week podcast, I talked about the history of jihadist mobilization in the Sahara and Sahel and the impact of France’s 2013 intervention in Mali, the resonance and explanations for this violence beyond a local framework, how people talk about politics and violence in Africa, and how I view the role of historical methodologies in understanding current affairs. I will continue to explore these and related ideas in some upcoming writing about Mali as well as Algeria and Morocco for different publications. In the meantime, I’ll use this space to do some less formal writing, to flesh out ideas, and to continue the kind of dialogue I’d like to see take place about the concepts, issues, and places that are important to me. Stay tuned. Given the length of yesterday’s post on Belmokhtar and MUJAO and the detail I used in explaining the subject, I decided to write an abstract for those who don’t want to wade through 3,000 words on Sahelian militant groups. I’ve also added in a few thoughts since yesterday. You can read the full post here. The Mauritanian news service ANI carried the news Thursday that two closely linked Sahelian jihadist groups, the Movement for Tawhid and Jihad in West Africa (MUJAO in French, generally MUJWA in English) had merged with the group led by former AQIM commander Mokhtar Belmokhtar, Katibat al-Mulathimeen, creating a new group called al-Murabitun after the 11th-century Muslim empire that encompassed parts of Morocco, Mauritania, Algeria, and southern Spain. While there is much we do not yet know about this group, including the identity of its leader, the post details some of my initial thoughts about the reasons behind the merger on a local and more international level, as well as what the merger might mean. Given the close personal and operational ties between Belmokhtar and MUJAO, going back to the latter group’s founding, it is not surprising that the two merged. What is less clear is why the groups decided on a formal merger when their cooperation was so close, and why they did it now. One possibility is that the formalization of their relationship was meant to deal with organizational and leadership deficiencies in MUJAO, especially given the fact that the group has had to adapt after the French intervention in January of this year in Mali scattered the region’s jihadist groups. Another possible explanation for the merger is that the impetus came from an outside force, notably al-Qaeda’s Core command in Pakistan. This is possible given Belmokhtar’s longstanding connections and frequent appeals to the group’s core leadership, and interesting timing in light of the reports that recently surfaced about a “conference” held electronically by Ayman al-Zawahiri with inputs from a number of representatives of al-Qaeda affiliates. Such a move could be a recognition of Belmokhtar’s high-profile attacks on the Tigentourine gas plant in southern Algeria in January, as well as the attacks on the Agadez military base and Arlit uranium mine in northern Niger in May. It could also be a sign of the continuing shifts in Sahelian militant structures, as AQIM continues to focus more on the Maghreb states while Belmokhtar and MUJAO further solidify their place as the Sahelian face of al-Qaeda. Without knowing more about the aforementioned conference, it’s impossible to say, though RFI’s report from this morning that the name of the group’s new leader may come “from Pakistan” suggests the hand of al-Qaeda’s central leadership. Either way, we’ll know more when the new emir’s identity becomes public. Given the rhetoric used in the initial announcement to ANI as well as a statement Belmokhtar made to the paper, it would seem that the group seeks to represent a continuation and evolution of AQIM’s “glocal” position, with a possible territorial expansion based on Belmokhtar’s growing regional connections and profile as well as ongoing events of intense interest to jihadis, such as the military coup and crackdown on the Muslim Brotherhood in Egypt. In this context, the group’s name is very evocative; it represents on the one hand a continuation of AQIM’s use of local historical figures and references, with an eye to the themes and terms that will also have resonance with the global jihadist community. Notably, while the statements reference Egypt (which caught the eye of the international media) its stated focus remains French interests and those of France’s allies, again a continuation of past rhetorical and operational practices from both AQIM and Belmokhtar. Finally, there is the question of why Belmokhtar would decide not to take over the new group himself. If the decision was made by AQC, then he may not have had much choice in the matter. Given his taste for independent actions and flexibility, however, this arrangement would allow Belmokhtar to focus on his operational pursuits, rather than the management of a new and larger entity. Since writing the post, it appears that some analysts, notably France-based AQIM specialist Mathieu Guidère, have suggested that the merger and Belmokhtar’s language about the need to pass leadership on to a younger generation means that Belmokhtar is removing himself from the picture. While this is possible, I do not share Guidère’s interpretation. For years now, dubiously-sourced reports have circulated about Belmokhtar’s imminent plans to retire from the jihadist scene, to only pursue smuggling activity, to cut a deal with the Algerian government and more. Yet in this time Belmokhtar’s activity and status have grown, and these reports have all been proven false. So I will not believe that Belmokhtar has left the game until I see it. Yesterday morning, the Mauritanian news service Agence Nouakchott d’Information (ANI) carried an announcement from the Movement for Tawhid and Jihad in West Africa, or MUJAO in French (led, according to the story, by Ahmed Ould Amer, previously identified as the group’s military commander) had merged with longtime Algerian jihadist leader Mokhtar Belmokhtar’s Katibat al-Mulathimeen (“the masked/veiled Battalion”) to form a new jihadist group, al-Murabitun, an homage to the 11th-Century Almoravid Empire that founded Marrakesh and at one point stretched from southern Spain south to Mauritania, and also included parts of what is now Algeria. In the initial statement, the group spoke of the merger as part of an effort to unite Muslims “from the Nile to the Atlantic” in order to meet the “zionist campaign targeting Islam and the Muslims.” The statement also notes that the group will fall under the leadership of another emir who for the moment is unnamed, which a source told ANI is a non-Algerian who fought Soviet forces in Afghanistan as well as American forces in 2002, before eventually traveling to Mali and taking on a leadership role in fighting against French forces. In the more complete Arabic version of the ANI article (full disclosure, I used Google Translate and got help from my blog partner Aaron Zelin for these references), the statement mentions a litany of abuses against Muslims, including the infamous cartoons of the Prophet Muhammad that appeared in 2006 in Denmark, attacks on Muslims in Palestine, Iraq, Afghanistan, and now Northern Mali, and the rejection by secularists of all things Islamic, specifically citing the recent coup in Egypt that deposed President Mohamed Morsi. The statement calls for unity of Muslims and Islamic groups, and specifically threatens attacks against France and its interests around the world, as well as those of its allies. The statement also hailed Mauritanian ‘ulema who expressed opposition to the French intervention in Mali, and closed by affirming the group’s commitment to al-Qaeda leader Ayman al-Zawahiri and drew its inspiration from al-Qaeda and the Taliban, notably Mullah Omar, Zawahiri, and Osama bin Laden. As Aaron pointed out to me, the statement specifically uses the term “Nafir” a term used by Abdullah Azzam and Abu Musab al-Suri to refer to a call to arms or to battle, in this case “to the land of jihad” — though the statement does not specifically state where this “land of jihad” is. In another statement to ANI (so far only published in Arabic), Belmokhtar explained the decision to form the group by making strikingly similar statements to the release announcing the creation of al-Murabitun, saying that the group would operate regionally in North Africa as a first step toward uniting the mujahideen and all Muslims “from the Nile to the Atlantic” and affirming the commitment not just to Zawahiri and Mullah Omar, but to the intellectual, moral, political, and military ideas and methods espoused by bin Laden. Belmokhtar repeatedly stressed the need for unity and explained why he was not taking on the group’s leadership role in saying that it was time for a new generation of leaders during a time of “promising prospects” in the advancement of religion. What follows are some of my thoughts about what this merger may or may not mean, what the shift specifically says about militancy in the Sahel, and how it fits into broader regional shifts and those specifically related to al-Qaeda. I should caution that these are initial thoughts, and may very well change as new information comes out related to this new venture. For the small group of people passionately tracking affairs in northern Mali and the broader region, a merger between Belmokhtar — who established a new katiba late last year while also taking his own katibat al-Mulathimeen from AQIM’s command structure — and MUJAO will likely not come as much of a surprise. Belmokhtar has always been close to MUJAO, and all of those who have at various times been named as MUJAO’s leaders, including Hamada Mohamed Ould Kheiru, Sultan Ould Badi, and now Ahmed Ould Amer (also known as Ahmed al-Telmassi, a reference to his origins in the Tilemsi Valley north of Gao) either worked with at various times or directly under Belmokhtar, and Ould Kheiru and Ould Amer are both reportedly very close to Belmokhtar. This closeness has been apparent for some time (I have written about it here, here, here, and here), and became all the more apparent after northern Mali fell last year and Belmokhtar chose to quite openly set up shop in Gao, the city that MUJAO controlled partially from April until June and then exclusively until they were forced out by the French intervention. Some sources have even described Belmokhtar as one of MUJAO’s original founders. Moreover, MUJAO and Belmokhtar worked closely together, whether during the attack in Gao in which Belmokhtar’s and MUJAO’s forces expelled the Tuareg MNLA from the city, to when Belmokhtar’s and MUJAO’s forces took control of the smuggling town of In Khalil in December, and then the coordinated attacks at In Amenas in January and against a military base in Agadez and uranium mining facility at Arlit in northern Niger in May, as well as the assault on Niamey’s civil prison on June 1. So if they were working together before, why merge now? For one thing, MUJAO has undergone a series of changes in the short time that it has existed, and may still be working its issues out. On the one hand, MUJAO has carried out or taken part in numerous successful operations (in the odd metrics often applied by jihadist groups to their own actions), including small- and large-scale suicide bombings, the kidnapping of foreigners for ransom and possibly the release of prisoners, and the administration of a city — even as it’s harsh interpretation of shari’ah helped drive people away from the group. Still, MUJAO has gone through a series of important shifts. In October 2011 MUJAO’s stated goal was to propagate jihad in West Africa, referencing key figures in regional Muslim history in the process, yet its first operations were all against Algerian targets. After the fall of northern Mali the group was involved in the administration of Gao and increasingly the areas around it, even while staging a large suicide attack at the Algerian Gendarmerie base in Ouargla in June. With the jihadist push south (in which MUJAO took part, despite reported opposition from Kheiru) and French intervention a new phase began, one of guerrilla attacks in multiple parts of northern Mali, and the involvement of MUJAO fighters and sometimes key personnel in the In Amenas and Niger attacks. During this time, the group has also experimented with different structures and dealt with leadership conflict; as I previously noted, it remains very unclear who actually runs MUJAO, and different leaders at different times have clashed with others over the handling of matters in northern Mali, notably when Ould Badi reportedly took his fighters to join Ansar al Din last fall in opposition to the takeover of In Khalil. The group has, by my count, reorganized its leadership and battalions at least three times before now, including Belmokhtar’s reported creation in January of a “Mujahideen shura” that would comprise fighters from MUJAO and Belmokhtar’s al-Mulathimeen, and the designation of Ould Badi as the head of a group specifically tasked with dealing with MUJAO’s remaining hostages. Today’s announcement, then, appears to be the latest in a series of adaptations to changing environments in the region, and may even just be the formalization of a merger that had already happened. It could also be, as Mauritanian journalist and AQIM expert Hacen Ould Lebatt noted in an email, an attempt to give the group true leadership, which it has lacked since its founding. In that vein, it will be very interesting to see who is actually taking over this new batallion, but if ANI’s description is accurate it will be someone with extensive jihadist experience, as well as someone who mirrors Belmokhtar’s path, with a history both in Afghanistan (possibly with al-Qaeda’s core organization) and the Sahel. As with many things related to Belmokhtar and the past activities of those close to him, the statements and group formation have both very local and very international registers. Over the past few years I have repeatedly expressed my support for the conception of AQIM and related groups as “glocal”, groups that often think and speak globally but generally act much more locally. For lack of a better way to put it, the group’s announcement is a very “al-Qaeda” statement, redolent with themes and direct messages linked to the group and it’s “core” leadership. While jihadist statements often appear very similar by virtue of shared ideologies and reference points (not to mention a shared self-image), it is worth pointing out that this statement and Belmokhtar’s comments make repeated and explicit reference not just to al-Qaeda’s leadership (as well as the Taliban), but also the reference of specific concepts favored in the past by leading global jihadist figures, such as Azzam and al-Suri. Moreover, the statement explicitly threatens not just a more “global” jihadist target, in the form of France, but also situates al-Murabitun, at least rhetorically, as trying to unify and defend Muslims across the region, even papering over the decades-long disputes between jihadists and the Muslim Brotherhood to present all groups as part of a broader Islamist project, one opposed in this context by Crusaders, Zionists, and secularists. On the other hand, the statement still fits within Belmokhtar’s past and more recent history of imbuing his speech and actions with local and more regional and international significance. 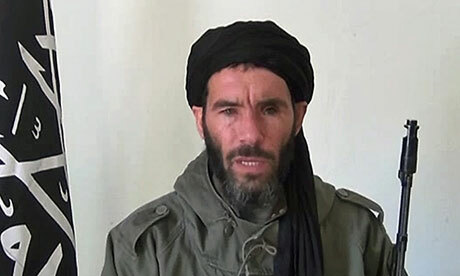 Despite long being derided as a mere smuggler, a criminal, and as one paper briefly wrote after the In Amenas attack, a “One-Eyed Pirate King of the Sahara”, Belmokhtar has a long jihadist resume that includes training in Afghanistan and two decades of membership in Algerian militant groups, from the GIA to the GSPC to AQIM. He was the first Algerian militant commander since the GIA to actually stage an attack outside of Algeria (and he paid direct homage to the GIA unit that carried out those attacks), and he has for years spoken of his admiration and loyalty to bin Laden, Zawahiri, and situated his own actions and thinking within those of al-Qaeda. Before he formed al-Mouwakoune bi-Dima (“Those who Sign with Blood”), Belmokhtar’s close confidant Omar Ould Hamaha confirmed that Belmokhtar would still remain under the orders of al-Qaeda’s core command. At the same time, while this new venture continues Belmokhtar’s and MUJAO’s rhetorical association with al-Qaeda, it also emphasizes the group’s regional focus, both in explicitly mentioning its operations within North Africa (even as the group hopes to expand, geographically) and specifically in threatening France, the onetime colonial power in much of North and West Africa. This is, in effect, still a continuation of AQIM’s mold, given that the group was given entrance in al-Qaeda to “form a bone in the throats of the crusaders” in Zawahiri’s words – notably France. And Belmokhtar’s attacks against international targets, especially at In Amenas and in Niger, have had both local and international resonance. Belmokhtar out of the spotlight? If you’ve gotten this far, you might ask why, if Belmokhtar is so important and central to happenings regarding MUJAO, he did not simply take command of this new group himself. The honest answer is that at this point, I have no idea. However, I do not share the surprise that some very smart AQIM watchers have expressed that Belmokhtar would not submit to someone else’s control; he has at least paid lip service in the past to his position under al-Qaeda’s command as well as that of his AQIM leadership (notably Abdelmalek Droukdel), and his problems with leadership in the past seem to have largely been specific rivalries, such as that with his fellow Sahelian AQIM commander Abou Zeid or with Droukdel or AQIM’s shura in northern Algeria. That said, it took him years to break with this structure, and only, it seems, under immense pressure from the organization itself. He also operated under multiple commanders in the Sahel, including Yahya Djouadi and Nabil Makhloufi, without actually breaking from the organization. What is clear is that Belmokhtar likes to do his own thing, and has made wide-ranging contacts outside of his native Algeria, from Mauritania (where he has recruited fighters for years) to Mali (where he has married into at least one local family) to Niger (where he has operated and recruited) to Libya (where he spent time in late 2011 and 2012 making connections in key areas like Oubaria, connections that reportedly helped him acquire weapons and later operate). I would suggest the possibility, then, that accepting a technically subordinate role for Belmokhtar may not be a slight, but instead the chance for him to divest himself of the tasks of running a larger organization in order to focus on his operations. This explanation is of course speculative, and rests largely on who the new leader of the brand-new al-Murabitun is. Their identity will hopefully tell us, for instance, if the emir is a friend or contact of Belmokhtar’s, another figure of the Sahelian jihad, or perhaps someone imposed from the outside. It is possible, for instance, that this maneuvering came about as a result of the now-infamous “conference” headed online by Zawahiri and involving the participation of a number of al-Qaeda leaders and the heads of affiliated or linked groups. Without knowing who participated in that conference, and in particular without knowing if Belmokhtar or anyone linked to his organization or MUJAO participated, it is impossible to say. But the identity of al-Murabitun’s chief may tell us some important things about what exactly the group wants to do, and where. I’ve explained from an organizational perspective why I think this new group may have been created. But that doesn’t necessarily explain why, on a more general level, this group would come into being. Perhaps it is as simple as needing to assert more control over an unruly organization buffeted by intense combat with French forces and pressure to scatter across the Sahel. On the one hand, the tumult in Egypt, Libya, and Tunisia could have provided the impetus to create a new group, or the appearance of a new group, in order to take advantage of the chaos and signal an intention to expand operations accordingly. The references to Egypt, for instance, stuck out to some as a direct threat to attack there. While this is absolutely possible, in light of the lively weapons and other smuggling networks from Egypt to Libya and the rapidly expanding conflict with jihadists in Egypt, the actual statement only directly threatens attacks against French targets and those of their allies. Reference to Egypt here seems much more like a rhetorical device, one that will certainly resonate with many people, but not necessarily a signal of impending attacks. While it is also possible that this group’s creation was ordered by al-Qaeda’s central command, it is just as likely that the group is an attempt to set up a more coherent jihadist organization in the Sahel and North Africa with a more explicitly broad reach. While AQIM likely has connections with fighters in Libya and perhaps beyond, and is said by regional intelligence agencies to be playing a significant role in events in Tunisia, notably in Jebel Chaambi on the border with Algeria, its actual activities seem to have remained focused largely on Algeria. In the last months and even years, AQIM has quietly increased its activities in the north, largely concentrated around traditional tactics of IED emplacement and ambushes. Yet this still leaves space for another organization willing to engage in attacks across a wider geographical space, and in particular the kind of large-scale attacks that Belmokhtar and MUJAO executed in Algeria and Niger. In this context, it is interesting that al-Murabitun’s leader is supposedly not Algerian, and that the group has threatened attacks across a wide front; MUJAO was purportedly created due to anger among non-Algerian members of AQIM, notably Mauritanian and Malian Arabs, that too much preference was still given to Algerians for leadership positions within the organization, and that AQIM had strayed too far from the path of jihad. The death of Abou Zeid in March, along with other AQIM leaders close to him, may have made even more space for Belmokhtar to operate. Ultimately, this kind of analysis is an exercise in trying to read dancing shadows in a candlelit room. We do not know far more than we will know about these groups, their interactions with each other, and the interpersonal and environmental dynamics that drive them. Hopefully as more information emerges our knowledge of these moving pieces will change, grow, and sharpen. Until then, all we can do is continue to watch this space. *As an added aside, al-Murabitun (those who do ribat), comes from the Arabic word for fortress, and denotes warriors on the edge of an empire or state who protect those inside or expand the territory. For those who have read al-Qaeda’s history, that sounds an awful lot like al-Qaeda’s original ideal, to establish a small group of fighters who would be a vanguard for a broader revolution that would sweep the Muslim umma. Thanks again to Aaron for pointing out the original meaning of the word. Against the odds and predictions of many analysts, Niger has, up until recently, been able to fend off the security crises that have shaken the Sahel over the last two years. However, with the near-simultaneous suicide attacks that struck two key northern areas — a military base in the key city of Agadez and the uranium mine in Arlit run by Somaïr, a subsidiary of the French nuclear giant Areva — this period of relative calm may have come to an end. While news is still emerging, this post is an attempt to provide context and a preliminary assessment of what we know so far about these attacks. I will also look at what the attacks signify regarding the evolution and current state of jihadist militancy in the Sahel, before briefly looking at the overall security environment in Niger. The bombings took place in the early morning hours on Thursday, about 30 minutes apart. At Arlit, suicide bombers believed to have been in military uniforms snuck their truck into the compound before detonating their explosives, wounding 13 Nigerien Areva employees and killing one. In Agadez, northern Niger’s most important city and a nodal point for the military as well as licit and illicit business, the toll was far worse: the initial suicide bomb killed at least 20 soldiers and a civilian, while several fighters reportedly equipped with suicide vests took several Nigerien army officer-trainees hostage. It was not until the following morning that French Special Operations Forces intervened alongside Nigerien soldiers to clear the holdouts, but not before the militants executed three of the officer-trainees. While Niger’s defense minister initially denied that any hostages had been taken, as many as three jihadists and three hostages may have been killed in the assault. At least 25 people were killed in total, and at least eight jihadists may have been involved in the attacks, the first suicide bombings ever on Nigerien soil. The attacks were also among the worst security incidents in the region since the January 2013 assault on the Tigentourine gas plant in southern Algeria by fighters operating under former AQIM commander Mokhtar Belmokhtar. Just hours after the attack and an initial claim of responsibility by the AQIM spinoff MUJAO, it was Belmokhtar’s turn to claim that he too was responsible for the attacks. He followed a claim by his longtime media representative Hacen Ould Khelil (also known as Juleibib) with a written claim of responsibility sent to the Mauritanian Agence Nouakchott d’Information (ANI), and also posted on jihadist forums. The MUJAO statement referenced Niger’s involvement in France’s “war against shari’ah” and promised attacks in Senegal, Côte d’Ivoire, and Benin, while Belmokhtar’s statement on behalf of his Katibat al-Mouwakoune Bi-Dima (“Those who Sign With Blood”) promised further attacks in Niger if they do not withdraw their forces from Mali. It also threatened attacks against other countries involved in peacekeeping and other operations there conducted by “columns of jihadists and martyrdom candidates…awaiting the order” to attack their targets. Juleibib, for his part, said that Belmokhtar himself supervised the “operational plan” for the attack. Both Belmokhtar’s and Juleibib’s statements described the operation as a joint attack by MUJAO and al-Mouwakoune Bi-Dima. Juleibib added that the group of fighters involved jihadists from Sudan, Western Sahara, and Mali, and that the operation was named for deceased Saharan AQIM commander Abdelhamid Abou Zeid, long reputed to be locked in a rivalry with Belmokhtar for dominance in the Sahel. Belmokhtar’s re-emergence caught many by surprise — at least those who believed the less-than-convincing assertions from Chadian officials and then President Idriss Deby, first that Chad’s forces had killed Belmokhtar in March in Mali, and then that Belmokhtar had “blown himself up.” If Belmokhtar’s role in these attacks are confirmed, it would mark the second time this year that he had staged significant and deadly attacks in the Sahel, attacks that have an increasing geographic footprint at a time when Belmokhtar and others linked to AQIM and a slew of other jihadist groups have also deepened ties in countries like Libya, from where Nigerien President Mahamadou Issoufou stated the Arlit and Agadez attackers crossed into Niger. And despite the persistence of “gangster-jihadist” headlines and monikers to describe Belmokhtar, he appears to have shown again his willingness and ability to stage attacks against well-protected and vitally important targets. First, let’s look at what these attacks do (and don’t) tell us about militancy in the Sahel. On the surface, there are points of comparison to In Amenas — the heavy use of high explosives (400 kg at Arlit according to Le Monde), coordinated attacks on heavily-secured targets with an experienced, well-trained, and well-prepared group of fighters who almost certainly had up-to-date information about their targets and a level of local complicity or assistance in planning and staging the attacks, and attacks against targets of strategic importance to regional governments as well as Western countries. The attacks showed, on the one hand, the continued close relationship between Belmokhtar and the fighters around him and MUJAO. Various sources disagree on when, exactly, the rapprochement between Belmokhtar and MUJAO took place; while MUJAO ostensibly started as a breakaway of AQIM, key leaders of the group included longtime Belmokhtar associates, and Belmokhtar made his headquarters in Gao, MUJAO’s base of operations in northern Mali, soon after the city fell. The two groups of fighters also collaborated militarily throughout last year and the Islamist offensive in Mali in January 2013, and some analysts have even described MUJAO as having initially been Belmokhtar’s initiative. Regardless, the collaboration has no doubt helped propel MUJAO forward as an extremely active group in terms of military activity. Since the January offensive, MUJAO has claimed all but one of the suicide bombings and combined-arms attacks against Malian, French, and other African forces in Gao, Kidal, Timbuktu, and elsewhere. MUJAO and commanders close to Belmokhtar (notably Omar Ould Hamaha) have also been involved in fighting in places like In Khalil, Ber, and Anéfis against the Tuareg nationalist National Movement for the Liberation of the Azawad (MNLA), and has deployed suicide bombings to varying degrees of effectiveness. The assaults in Agadez and Arlit, however, are notable for the scope and tactics deployed, as well as explicit decisions in targeting. The Niger attacks, unsurprisingly, far more closely resemble the siege at In Amenas (and earlier MUJAO attacks in the Algerian cities of Tamanrasset and Ouargla) than the more guerrilla-style engagements in northern Mali. For instance, the Agadez and Arlit attacks appear to have used vastly higher quantities of explosives than other engagements in Mali, and made more of an effort to plan assaults in a way that would create higher casualties and more damage, in particular to infrastructure. 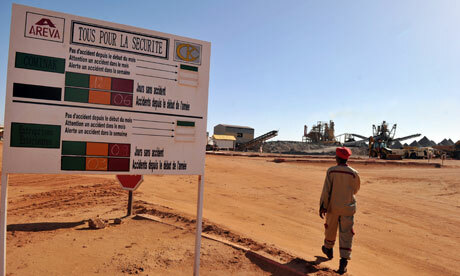 While the vast majority of those killed in the attacks died at the military base in Agadez, the attacks at Arlit reportedly seriously damaged the facility, shutting operations down for the moment at the Somaïr mine for at least two months, a shutdown that will cost an estimated 27 million Euro a month as the company continues to assess the true extent of damage there. Likewise, various reports from In Amenas have showed that at least one of the key goals for the attackers was to destroy or seriously damage the facility, not just to kill or abduct foreign workers. In some ways, the Niger attacks marked not just a continuation but an escalation from In Amenas. Both attacks struck key targets in the energy industry, targets that were not just vital sites of foreign investment, but sites that were of key importance for both international governments but also for local governments. The Tigentourine site (which is still not fully operational nearly five months after the attack) provides close to 10% of Algeria’s natural gas and is exploited jointly by the Norwegian company Statoil and British Petroleum, though the latter have expressed concerns about their the level of security around oil and gas sites in Algeria. The Somaïr mine, meanwhile, is the largest of the Areva-linked mines in Niger, a country which provides approximately 37% of Areva’s uranium and nearly 20% of France’s uranium, in addition to 5% of Niger’s GDP. For a poor country whose biggest private company is Areva, as well as a rich country heavily dependent on nuclear power plants, uranium production in northern Niger is thus of extreme importance. Moreover, while Arlit has been the site of AQIM activity in the past (notably the kidnapping of seven employees or dependents of Areva subcontractors in September 2010 and the theft in 2011 and 2012 of drilling and other heavy equipment) this attack marks the first attempt to seriously impact production and damage the site itself, much like In Amenas. However, the attacks exhibited differences in the specific use of violence. While the In Amenas attackers brutally executed some foreign workers outright and turned others into walking bombs, Algerian workers at the site were largely spared violence, something the attackers made a point of explaining to the workers. In Niger no such overt attempt to spare Muslims was made, though it is worth noting that Muslim soldiers are hardly a new target for Belmokhtar and AQIM, who have in fact long restricted their attacks either to foreign government targets or regional military targets, and whose units have clashed with Algerian, Mauritanian, Malian, and Nigerien military units. Still, the Agadez bombings and subsequent assaults show a more direct, effective, and planned assault on a major military base, something more familiar to Iraq or Afghanistan than the Sahel. Rarely, however, have AQIM or AQIM-linked fighters attacked such heavily-protected targets. Since late 2010, France has quietly been increasing its Special Operations and other military presence in Niger and other Sahelian countries, with the troops serving in France’s Commandement des Opérations Spéciales (COS, more or less the French equivalent of the American JSOC) serving under the auspices of Operation Sabre. American and French (and possibly other) Special Forces have been providing training for Nigerien forces for years. Niger was part of the original four countries under the American Pan-Sahel Initiative, launched in 2002. And intelligence, support, and kinetic forces have been increasingly present in Niamey and points north, notably Agadez — where the American military initially wanted to base surveillance drones currently in Niamey — and Arlit. In addition to the 500 Nigerien troops in Arlit and the 5,000 soldiers on the border with Mali, there are reportedly 60 French SOF members in Arlit alone, likely part of the post-Operation Serval deployment of SOF to reinforce mining sites, including Arlit. Yet despite this impressive array of forces and security arrangements, Belmokhtar and MUJAO still opted to strike. The attacks marked the emergence of Niger as a new terrain of combat operations for Sahelian jihadists, demonstrating the migration of fighting away from Algeria and Mali as well as providing more possible evidence of the emergence of southern Libya as a site for militant training, planning, and staging for operations in other countries. This is the continuation of a multi-year process of diversification of militancy in the Sahel. This period has seen splits and subdivisions within militant groups that has allowed for more targeted recruitment and a re-focusing of militant activity along broadly regional lines. In keeping with its stated foundational purpose MUJAO has expanded its operations in Sahelian or Saharan areas (Mali, southern Algeria, Libya, Niger, and possibly Chad), while AQIM, notably the northern Algeria-based katibat have adopted a lower public profile while moving progressively further east into Tunisia, among other areas. The AP’s Rukmini Callimachi uncovered fascinating evidence of some of these internal splits and divisions in Timbuktu, including a letter from AQIM’s shura chastising Belmokhtar for a litany of purported slights. These critiques focused in part on Belmokhtar’s failure to follow orders, but also failure to stage a large-scale “spectacular” attack, a supposed deficiency many specialists noted Belmokhtar may have been trying to fix first with the attack at In Amenas and now in northern Niger. It is notable, then, that Belmokhtar decided to name the attack after his erstwhile rival Abou Zeid, a sign of conciliation and unity among Sahel-based jihadists after the splits of the last year that could also be seen as a snub in the direction of AQIM in the north — though we should be careful not to read too much into a name. What is clear, though, is that jihadism in the Sahel has bled progressively into new areas even as groups shift and change orientation, all the while continuing to draw in a diverse cross-section of actors and even groups. Looking at this new map of jihadist activity in North Africa and the Sahel, it would be premature to posit a clean distinction between these groups nor the emergence of what some have termed an “arc of instability” in North and West Africa, but rather to show the diversification and spread of these movements among other salafi-jihadi groups that have emerged in the Maghreb and Sahel and have either sent fighters to places like northern Mali for combat and training or otherwise come into contact and forged relationships with their more-established counterparts. This is an ongoing process that has already had a marked influence in militant attacks from Libya to northern Nigeria, one that will continue to evolve and impact parts of the region in different but serious ways. This impact will likely be felt in an acute way in Niger. For the past two years, Niger has juggled an almost impossibly complex security situation. The government of Mahamadou Issoufou has dealt with the fallout from the crisis in Libya, including the return of hundreds of thousands of fighters and workers as well as the loss of remittances and patronage, the collapse of Mali next door, a worsening of the security situation on the southern border with Nigeria, and according to interviews in Niamey last month the rumblings of unrest in Toubou areas in northeastern Niger. And now, despite having a fairly professional and well-trained military, not to mention intelligence, material, and combat support from Western countries, a well-trained group of fighters was still able to penetrate and damage two heavily-protected and important areas. Increased attacks in the country, whether in the north or in the capital, would increase the strain on a government that already prioritizes security issues (albeit with good reason). Niger’s defense budget, which occupies 10% of the total budget, has been increased twice in two years, and nearly half the armed forces are either in Mali or on the border with Mali. Further unrest in Niger or on the borders will make things increasingly difficult for the country to muddle through, despite its intelligent handling of past crises and maneuvering over the last two years. This is a particularly acute concern in light of evidence of local radicalization and Nigerien recruitment to MUJAO, the reports of increased connections over the past several years between AQIM, MUJAO, and Boko Haram, and the increased Boko Haram activities in northern Nigeria. Many questions remain about the attacks last Thursday and their effect on the region. We will get answers to some of those questions, but not all. But the attacks in northern Niger have once more shown the determination of militants to stage significant attacks, cast a light on the changing nature of militancy in the Maghreb and Sahel, and shown the persistent security challenges facing the region’s fragile states. Documents recovered from battlefields are tantalizing to an analyst. They contain raw data that can be mundane or groundbreaking, holding out the prospect of knowledge often hidden under dull pleasantries, flowery language, and stains left by the very destruction that made them available. They can also provide insight into little-understood insurgent groups, as seen most recently in the sands and bombed-out buildings of northern Mali’s main cities. As reporters have flooded in just behind French, Malian, and other African forces, some have been digging through the reams of paper left behind as al-Qa’ida in the Islamic Maghreb (AQIM), the Movement for Tawhid and Jihad in West Africa (MUJAO) and Ansar al-Din fled Gao, Timbuktu, and Kidal, seeking refuge in riverine villages and mountain hideouts. Just last week, The Telegraph, Foreign Policy, and the Associated Press published some of these documents, providing a glimpse into the day-to-day operations of these groups in northern Mali, the minute detail put into the implementation of shari’ah, possible divergences over strategies and leadership, and the long-term plans AQIM’s leadership had (and may still have) for the Sahel. These are not the first instances of documents emerging from the failed jihadist offensive in Mali; the AP’s Rukmini Callimachi and Baba Ahmed previously found AQIM commander Abou Zeid’s trash and notebooks in Diabaly, while Lindsey Hilsum explored documents that littered the floor of the Islamic Police station in Gao following that city’s liberation. But they do show that we may soon learn much more about how AQIM and its affiliates thought and operated before and during the 10-month occupation of northern Mali. However, it is important when analyzing these documents to provide the necessary context to understand what these documents do (and do not) show. For instance, the AP report, which details a 9-page letter from AQIM leader Abdelmalek Droukdel, shows divisions between Droukdel and his subordinates over the speed with which the latter implemented shari’ah in Timbuktu, as well as the failure to collaborate effectively with local groups, including the National Movement for the Liberation of the Azawad (MNLA). The primary evidence provides key evidence not just of disagreements between the leader and his lieutenants, but also shows that Mali was part of a long-term strategy for AQIM to implement shari’ah in the north, or at least plant the “seeds” of the idea. What the article does not note is that when Droukdel expressed these ideas to his local commanders some time after June (the letter is undated), it was not the first time. In May, Droukdel released an audio statement saying much the same thing, urging AQIM to use local Islamist groups like Ansar al-Din as cover for their activities in northern Mali, pushing for the gradual implementation of shari’ah in the north, and urging cooperation with the MNLA. Droukdel’s missive to AQIM in Timbuktu was not, then, the first instance in which he’d urged this path, a fact that could explain his pique at the actions undertaken subsequent to his “directions” from May. Furthermore, it is also possible that unease at the failure to implement his orders prompted Droukdel in part to travel to northern Mali at some point over the past year. The documents unearthed by the various media organizations also show the difficulties in communication between northern Algeria (where Droukdel was previously based and to where he may have returned after his time in northern Mali) and the desert thousands of kilometers to the south. Droukdel has reportedly struggled for years to keep the southern katibat in line, sending three different men to the south to assume overall control of these fighters and appointing a fourth, Yahya Abou al-Hammam, after Saharan emir Nabil Makhloufi was killed in a car accident in August. It is also possible that Droukdel traveled to Mali to more directly coordinate with his commanders and with other militant and local leaders, including Ansar al-Din’s Iyad Ag Ghali. Unfortunately, it is a vanishingly small group of people that genuinely knows the truth about the subject. Still, the documents reinforce Droukdel’s isolation and the difficulty in maintaining control of far-flung and semi-autonomous commanders; Osama bin Laden struggled with this in Abottabad, and Droukdel has had to cope with increasingly effective military pressure from Algerian forces in and around Kabylia — another possible reason for him to have undertaken the dangerous and risky trip to Mali. Still, while these documents raise some fascinating subjects and questions, they provide only snapshots in a complicated tableau. For instance, the AP suggests that one of the reasons the past 10 months saw fewer amputations than Gao was because of direct AQIM leadership in Timbuktu, as opposed to that of MUJAO in Gao. This is definitely a possibility, though it could also simply be because different leaders with different personalities and different personalities behave differently. Additionally, Ansar al-Din/AQIM in Timbuktu still engaged in their share of horrible and abusive behavior, just of another sort. I would suggest, though, that aside from the possibility that different leadership drove different group behavior, we would be well-served to look at the actual composition of these groups’ recruits. To take Gao as an example, we have known for months that the group recruited heavily from the Gao region, specifically from villages that have long been known for “Wahhabi” religious practice, the term used by many in Mali to refer to reformist or Salafi practices. I strongly suspect that this had a significant impact on the group’s actions in Gao, especially given that the fighters present in the city were largely these local recruits, though in recent months foreign fighters and in particular foreign leaders became more prominent in the management of affairs in the city. As for internal activity, in this we would be under the emirate of Ansar Dine. Our emir would follow their emir and our opinion would follow their opinion. By internal activity, we mean all activity connected to participating in bearing the responsibilities of the liberated areas. In external activity, connected to our global jihad, we would be independent of them (Ansar Dine). We would ensure that none of that activity or its repercussions is attributed to them, as care must be taken over negative impacts on the project of the state. If this sounds familiar, it’s because it appears to closely follow the apparent divergence between AQIM and MUJAO, with the latter group originally engaging largely in external activities yet still appearing to maintain a close or at least a working relationship with AQIM, the organization from which it ostensibly split in anger in late 2011. This is far from conclusive evidence for my contention that MUJAO’s formation represented a “managed separation” from AQIM but it does demonstrate the ability to accommodate multiple structures as well as the organization’s attempts to use group designs to shape outside opinions of northern Mali’s militant groups. It is very important that we view our Islamic project in Azawad as a small newborn, with many phases ahead of it that it must pass through to grow and mature. The current baby is in its first days, crawling on its knees, and has not yet stood on its two legs. So is it wise that we start now to lay burdens on it that will inevitably prevent it from standing on its own two feet and perhaps even smother it?!! If we really want it to stand on its own two feet in this world full of enemies waiting to pounce, we must ease its burden, take it by the hand, help it and support it until it stands. After France intervened militarily in Mali on January 11, a move that hastened the deployment of Malian soldiers and African partners to northern Mali, many expected a kind of ripple effect expanding outward from Mali. This was driven out of concern both that such a move would push militants into neighboring countries, and draw negative responses from Muslims around the world. Yet hordes of angry protestors have thus far not materialized, and the response so far among jihadist groups in the sub-region’s other prominent hotspot for violent extremism, Nigeria, has been decidedly mixed. The Boko Haram splinter group Ansaru, whose full name is Jama’atu Ansaril Muslimina fi Biladis Sudan, or “Vanguard for the Protection of Muslims in Black Africa,” attacked a group of Nigerian soldiers heading to Mali on January 20, killing two officers. Meanwhile, a Boko Haram spokesman announced a ceasefire after a brief increase in violence, to the general surprise of observers. However, these different responses may give us a window to examine differences between Ansaru and Boko Haram, the role that groups like al-Qa’ida in the Islamic Maghreb (AQIM) have and have not played in shaping these groups, and the frameworks analysts apply when examining jihadist militancy. This was the second kidnapping believed to have been carried by Ansaru, with the first coming in May 2011 when gunmen seized two men, a Briton named Christopher McManus and an Italian named Franco Lamolinara, from Birnin-Kebbi. Though the kidnapping was claimed by “Al-Qaeda in the Lands Beyond the Sahel” the British government suggested in October 2012 when it declared Ansaru a terrorist organization that the group was actually behind the seizure, which ended tragically in the deaths of both hostages in a failed rescue attempt in March 2012. As Jacob Zenn points out, this kidnapping was similar to to previous AQIM operations, and certainly looked very similar to the kidnapping of a German engineer in Kano, an operation claimed directly by AQIM (though I have lingering doubts about AQIM directly carrying out a kidnapping in Nigeria, as opposed to being allowed to claim credit for an action carried out by a group like Ansaru or another jihadist or criminal faction). Current writing about AQIM tends to obscure or leave out altogether important components of its history, namely that its predecessor, the Salafist Group for Preaching and Combat (GSPC) was itself a splinter group of the Armed Islamic Group (GIA), which formed in the late 1990’s largely in response to the uncontrolled violence perpetrated by the GIA against Algerian civilians. It is striking that, given the aspirational and possibly operational closeness between Ansaru and AQIM, Ansaru’s stated justification for its split from Boko Haram was largely the same as that of the GSPC in leaving the GIA. With that in mind, let’s re-examine Ansaru’s admittedly brief history. Broadly speaking, there are two ways of interpreting the May 2011 kidnapping in particular, as well as the December 2012 kidnapping and the January attack on Nigerian troops. On the one hand, the choice of name used to claim the May 2011 kidnapping, as well as the choice of tactics and target for that and subsequent actions, can be seen as overtures to AQIM, a means of showing agreement and a desire to cooperate by mirroring the more prominent organization. The other way to evaluate Ansaru’s actions is as a sign of pre-existing links with AQIM and associates of the group that in turn shaped the group that would eventually become Ansaru. As evidence to support the latter conclusion, observers have pointed to the role that a man known as Khalid al-Barnawi (alternately spelled Barnawy or Barnaoui) reportedly played in the kidnapping. Barnawi was designated as a “global terrorist” by the U.S. State Department in June 2012. The Mauritanian news service Agence Nouakchott d’Information (ANI) reported after the two men were killed that they were held by a group led by Barnawi, adding that Barnawi was one of the first Nigeriens* to join the GSPC and participated in the assault on the Mauritanian army post at Lemgheity in June 2005. His reported participation has in part led Zenn (see footnote 45) and Morgan Lorraine Roach to conclude that al-Barnawi is a leader in Ansaru. Another interesting indication of possible links to AQIM is that, again according to ANI, the negotiator handling talks for a ransom payment to free Lamolinara and McManus was none other than Mustapha Ould Limam Chaffi, a Mauritanian opposition figure, special counselor to Blaise Compaoré, and negotiator who handled multiple AQIM hostage takings. However Chaffi came to be part of the negotiations (assuming the ANI story was correct), his presence bolsters the anecdotal evidence of certain ties between Ansaru, or at least factions of Boko Haram, and AQIM. The possibility of ties between AQIM in northern Mali and Ansaru, or a Boko Haram faction that would later become Ansaru, raises a significant question about Nigerian jihadis in Mali. Nigerians have been reportedly training with the GSPC and AQIM for years, though the last two years and specifically the last nine months have seen a proliferation of reports placing Boko Haram fighters specifically in northern Mali, working alongside AQIM and allied groups. I’ve questioned these reports in the past, and while it seems certain at this point that Nigerian jihadis have been flowing in some numbers into northern Mali, whether to train, join AQIM/MUJAO, or cooperate with them, I have often wondered how exactly the journalists reporting these stories came to identify these fighters specifically as Boko Haram members. Did the fighters identify themselves as Boko Haram members? Did local witnesses hear fighters speaking Hausa, and assume that they were from Boko Haram? Did intelligence agencies tracking known Boko Haram members or Nigerian jihadis find evidence of movement into and out of Northern Mali? With relatively few exceptions, we just don’t know. But I would posit that given the anecdotal evidence and the ideological affinity between Ansaru and AQIM/MUJAO, at least some of the fighters in Mali identified as belonging to Boko Haram may actually have been with — or subsequently joined — Ansaru. While this may seem like a very nitpicky point (because it is) it could influence the relative strength of the groups in question, as well as their future operations. After all, different groups, even splinters that maintain ties, still have different motivations and make different cost/benefit calculations about operations based on different factors. Which ultimately goes to show that, counter to what some might think, not all Muslims think and react the same way to complex and rapidly evolving events. Not even Nigerian jihadis. *There seems to be some disagreement over Barnawi’s origin. The State Department refers to Barnawi as being from Nigeria, and indeed his name *could* signify that he is from the Nigerian state of Borno. However, as Alex Thurston pointed out last year, “Khaled al-Barnawi” is roughly the equivalent of “Bob from Maine” in terms of helping actually identify someone. Additionally, this name could simply mean that al-Barnawi spent time in Borno, something that would in no way be unusual for a Nigerien. While the U.S. Government may have specific information on Barnawi’s origins to which I am not privy, ANI is generally well-informed on security and terrorism issues, and cited a source close to AQIM for the story I linked to above. Below is a primer I put together on the four main jihadist groups currently operating in Algeria and Mali for Jihadica, who have been kind enough to solicit and post my work from the past week. Fellow al-Wasat editor Aaron Zelin was kind enough to compile the 4-part series, and links to the original posts appear at the bottom of the post. After a rush of deadly AQIM activity in northern Algeria in 2007 and 2008, Algerian authorities gained the upper hand and were progressively able to restrict AQIM to isolated and mountainous areas east of Algiers. AQIM’s kata’ib(battalions) in the Sahel, however, expanded, as Belmokhtar and Abdelhamid Abou Zeid (a senior AQIM commander) began a run of audacious kidnappings that led to an estimated tens of millions of dollars in ransom payments (more, according to some sources)–money reportedly bolstered by income from cigarette smuggling and taxes from the region’s growing drug trade. AQIM’s southern groups, believed before 2012 to number several hundred fighters, also continued operations across the region, killing tourists, conducting attacks (including suicide bombings) against regional and foreign militaries and government facilities. AQIM fighters are believed to have been heavily involved in fighting in northern Mali after the outbreak of the Tuareg rebellion in January 2012, and have largely controlled the city of Timbuktu since April. The man allegedly behind the gas facility attack, Mokhtar Belmokhtar, had, until recently, run AQIM’s Katibat al-Moulathimin (“The Veiled Brigade”), a reference to the practice of male veiling common in parts of the Sahel. In October 2012 AQIM stated that Belmokhtar had been “suspended” from the command of the group, owing to Belmokhtar’s supposed deviations from the goals of the group’s leadership. Belmokhtar was purportedly at loggerheads with three AQIM leaders: AQIM’s amir Droukdel, the recently-appointed Saharan emir Yahya Abou el-Hammam, and Katibat Tariq Ibn Ziad commander Abou Zeid. Belmokhtar’s spokesman denied the removal but in December Belmokhtar appeared on video for the first time to announce his departure* from AQIM and his creation of a new group, al-Mouwakoune Bi-Dima (“Those Who Sign with Blood”), a reference to the name of the GIA detachment responsible for the 1994 hijacking of an Air France flight. In his video, Belmokhtar said his group aimed to consolidate shari’ah in northern Mali. He also threatened to attack Algeria and France and called on Mauritanian imams to come to the aid of the “Azawad,” a term used largely (but not exclusively) by Tuareg nationalists to refer to northern Mali. In an interview with the Associated Press, Belmokhtar’s close associate Oumar Ould Hamaha relayed that Belmokhtar remained under the orders of al-Qaeda central. Moreover, the “split” with AQIM does not appear to have inhibited Belmokhtar’s actions; by all available indications he took his fighters with him to his “new” group, and they have reportedly been working alongside jihadist MUJAO group in Gao and in In Khalil (more on them tomorrow). In telephone calls with journalists during the current hostage crisis, jihadis involved in the attack said they were from “al-Qaeda” before specifying their membership in al-Moulathimin and al-Mouakoune Bi-Dima. They further conveyed that the operation had been in the works for two months, suggesting that the supposed internal turmoil in AQIM did not adversely affect the complicated preparations for a major assault staged hundreds of miles away from northern Mali. Algerian security officials said they took at least one member of the attack team alive, meaning that we may find out more about the group’s structure in the coming days and weeks. We do know that the attack team involved at least two longtime Belmokhtar aides, Abu al-Bara and Aberrahman al-Nigeri, and reports indicate that the hostage takers included Egyptians, Tunisians, Libyans, as well as possibly a Frenchman and a Canadian. *CORRECTION: In the video, Belmokhtar does not actually announce a departure from AQIM, only the creation of al-Mouakoune Bi-Dima. Instead, the talk of a “split” came from press accounts, including an Associated Press interview with close Belmokhtar associate Omar Ould Hamaha (h/t @GCTAT on Twitter). The Movement for Tawhid and Jihad in West Africa (MUJAO, in French) is an AQIM splinter group that publicly appeared in December 2011, when they claimed the kidnapping of three European aid workers in Tindouf, Algeria. Led by the Mauritanian Hamada Ould Kheiru*, an explosives expert, preacher, and longtime GSPC/AQIM member close to Belmokhtar, the group’s stated reason for leaving AQIM was the latter’s purported lack of devotion to jihad and failure to promote non-Algerians to leadership positions. Ostensibly dedicated to propagating jihad in West Africa, the group’s leadership was originally believed to be largely composed of Mauritanians and Arabs from the Gao region, though recent announcements indicate that the leadership has diversified to include a Saudi, an Egyptian, and a Tunisian, as well as other “foreign fighters”. The group has also reportedly recruited from local populations and some sub-Saharan Africans. MUJAO, which controls the Malian city of Gao, benefits from a close relationship with Mokhtar Belmokhtar, whose forces fought with and may have led MUJAO’s successful military attacks against the Tuareg nationalist group the MNLA in Gao in June, and in Ménaka in November. MUJAO and Belmokhtar’s Katibat al-Mulathimeen (Battalion of the Veiled Men) seized the infamous smuggling town of In Khalil (sometimes written as al-Khalil) in late December, and are reportedly involved in the current Islamist offensive in central Mali. One of the MUJAO’s key military leaders, spokesmen, and favorite quote machine for Western journalists, Omar Ould Hamaha, was a commander under Belmokhtar and was identified for a time as the military commander of Ansar al-Din. Hamaha is also, according to some reports, Belmokhtar’s father-in-law. While rumors abound that MUJAO receives support from local businessmen and known traffickers, in addition to foreign governments, MUJAO has also made an extensive effort to portray itself as a “true” jihadist organization by instituting hudud punishments in and around Gao, conducting attacks against foreign targets, and adopting a media strategy that includes a web forum, a Facebook page, a Twitter account, and battalion names recalling past Muslim leaders, famous jihadist figures, and also a local Muslim organization. Despite its stated focus on West Africa, MUJAO has conducted 4 operations (including two suicide bombings) in Algeria or against Algerian targets, in addition to the kidnapping of 7 Algerian diplomats from the Algerian consulate in the northern Malian city of Gao. MUJAO currently holds 3 of the 7–after releasing three and killing one–and one French-Portuguese hostage kidnapped in November. * While some sources indicate that Kheiru founded MUJAO in cooperation with other “dissident” AQIM members, this explanation is not universal. For instance, Mauritanian journalist Mohamed Mahmoud Abu al-Ma’ali, who published a lengthy analysis in May of the various jihadist groups occupying northern Mali, says that the group was founded by the businessman, smuggler, and AQIM member Sultan Ould Bady, with Kheiru subsequently joining the group. Regardless, both were represented as key leaders of the group until recently, when Ould Bady purportedly left MUJAO to join Ansar al-Din. In December the United States Department of State referred to Kheiru (written as Khairy) as a “founding leader” of MUJAO alongside Ahmed el-Tilemsi, when the State Department designated MUJAO a terrorist organization and applied sanctions to Kheiru and Tilemsi (but no other MUJAO leaders). Ansar al-Din was created in November 2011 by Iyad Ag Ghali, a legendary Tuareg powerbroker in northern Mali who led two rebellions against the Malian government in the 1990′s and in 2006. According to journalistic accounts as well as scholarly writing, Ag Ghali grew increasingly religious and joined the Tablighi Jamaat, the Pakistani Islamic missionary organization known for its piety as well as quietist political views. However, Ag Ghali at some point moved away from the group, and in 2010 Saudi authorities expelled him from his diplomatic post in Jeddah due to suspected contacts with unknown radicals. Various sources claim that Ag Ghali only founded Ansar al-Din after failing in his efforts to become the leader of the MNLA and of the Ifoghas Tuareg tribe, though as far as I can tell these claims all come from sources close to or within the MNLA. Initially composed of veteran rebels from the same tribe (and in many cases the same clan), Ag Ghali’s ranks were swollen in early 2012 by the addition of at least 40 AQIM fighters brought by his cousin, an AQIM commander named Hamada Ag Hama (commonly known as Abdelkrim el-Targui). Ansar al-Din played a key role in fighting the Malian army in Aguelhoc (where nearly 100 Malian soldiers were reportedly executed), Tessalit, and Kidal. After the March 2012 coup and the departure of the Malian army from the north, Ansar al-Din took responsibility for the cities of Kidal and Timbuktu. At least one “Ansar al-Din” leader in Timbuktu, Sanda Ould Boumama (Sanda Abou Mohamed), was a suspected GSPC and AQIM member, and AQIM is largely believed to have exerted real control over the city. Various Tuareg Ansar al-Din leaders and spokesmen engaged in negotiations in Burkina Faso and Algeria, and Ag Ghali himself endorsed mediation efforts to achieve a political solution to the Malian crisis. Nevertheless, the group’s leadership appears to be divided and has made contradictory remarks about the group’s goals, in particular where they sought to apply shari’ah (in Kidal? In northern Mali? In all of Mali? Across West Africa?). Ag Ghali himself put an end to the ambiguity when he announced the end of a ceasefire in January 2013, and then led an advance of Islamist forces into central Mali on January 10. This in turn prompted the French intervention in Mali the following day. Yet it is not just the militias aiming to retake the north that have their eye on Mali’s ethnic fault lines. On November 24, the jihadist forum Ansar al-Mujahideen published a statement in Arabic by the ‘Majlis Shura al-Mujahidin in Gao’ following the outbreak of fighting in Gao between the MNLA and the Movement for Oneness and Jihad in West Africa (MUJAO), a splinter group of al-Qaeda in the Islamic Maghreb (AQIM). This fighting, which broke out on November 16 near Ansongo and Ménaka, appears to have ended in defeat for the MNLA in the movement’s last major stronghold. While both sides and third parties have given dramatically different tolls from the fighting, witnesses and town notables have indicated that MUJAO forces executed some of those involved in defending the town, including the president of the local cercle, Alwabégat Ag Salakatou. In the forum statement, the ‘Majlis Shura al-Mujahidin’ – indicating the leadership council for MUJAO, whom Gao inhabitants generally refer to simply as “the mujahidin” – justified their combat against the MNLA, saying in an English translation posted several days later by the Ansar al-Mujahideen English Forum: “we [are] in our war with the MNLA (National Movement for the Liberation of Azawad) this secular movement that doesn’t want the implementation of the Islamic Sharia…the mujahidin fought it because they became like the Tawagit [tyrants]”. It continued: “we call them to resort to the Sharia [law] of Allah but they refuse” and claimed the MNLA was oppressing Muslims “by taking their money unjustly and killing them and their dividing of the Muslims”.